At the 46th Tokyo Motorcycle Show,TEAM MUGEN introduced “Shinden Hachi” the 8th iteration of the EV machine with which MUGEN will take on the Isle of Man TT Zero Challenge. 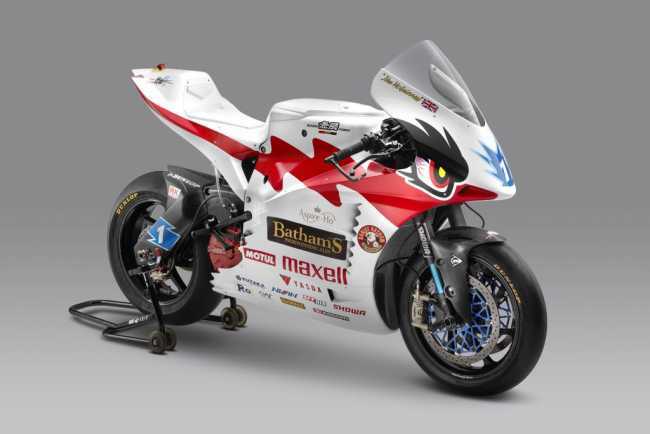 The team welcomes Bathams Brewery as a new sponsor this year, and will race as “TEAM BATHAMS MUGEN”. Revisions for 2019 include development of the electric drivetrain to provide an increase of output power, and aerodynamic improvements to improve bike stability and reduce drag at the higher speeds the bikes are expected to reach. As in previous years the team’s ambition will be to optimize their performance and win the race for the 6th successive year, and to further extend the lap record from the current 121.824mph, set in 2018 by Team MUGEN rider, Michael Rutter aboard Shinden Nana. Michael Rutter will return to the team for his 2nd year and will be joined by 23 time TT victor, John McGuinness. McGuinness returns to the Isle of Man after a 2 year absence due to injury, and will be looking to resume his winning ways straight away, and add to his two TT Zero wins. However, his 2019 team-mate, Rutter, is unbeaten in his 4 TT Zero races, and will be looking to defend his record while adding a 5th electric vehicle win to his name. Regardless of anything else, TEAM BATHAMS MUGEN is set up for a fascinating intra-team head to head contest over the TT fortnight.